This program welcomes everyone to participate in making the street a better place. If you want to have a positive impact on your local streets but don’t know where to start, joining the National Street Service is a great way to get involved. Coming Soon: the National Street Service in Corktown, Detroit! We’re kicking things off in Corktown, Detroit with a ten week National Street Service Program, a great opportunity for anyone who wants to make streets better for their community. During the program, you will observe and explore your street, create opportunities to help others reimagine what the street is for, and collaborate across neighborhoods on projects to make streets welcoming for everyone. We have just concluded a our one-month National Street Service Program in Pontiac and San Antonio. We thank everyone who applied and participated in the program! As a team member of the National Street service, there are so many ways you can make a positive impact on your favorite local streets. Our National Street service training program puts you in charge of your local streets, and guides you step by step to find problems and take action. Understanding the problems facing your own local streets is easy! There is so much to be learned just from getting out there, watching for problems, and talking to other people who share the street. People have real power to make change. This bench welcomes everyone to sit and enjoy the street, and it exists thanks to one of our Street Rangers, who worked with the Public Bench Project to install it. Many say that the pen is mightier than the sword. We say a stick of chalk is even mightier. Drawing on the street is a low-risk way to share our ideas for how the street can be better. If people don't like it, it washes away. If people do like it - we have new community support to convince local authorities to take action. A picture is worth a thousand words, and when it isn't safe to use chalk, photos and drawings are an easy way to share our ideas. 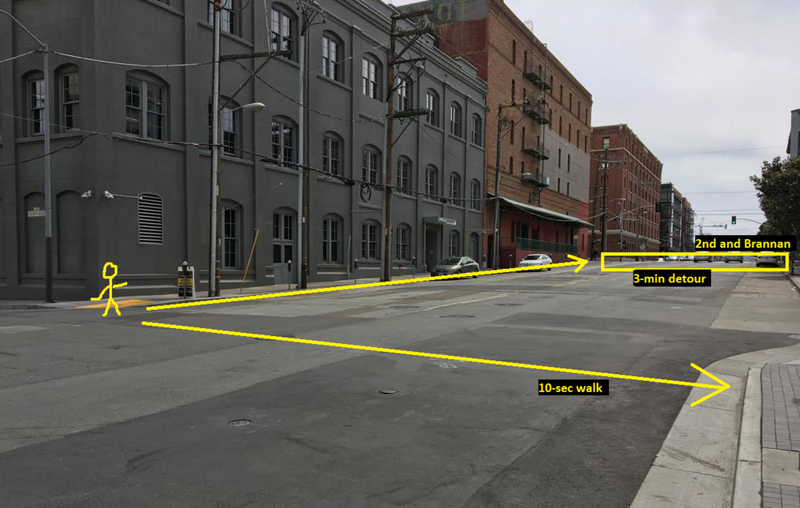 This picture was created to show a dangerous street crossing to San Francisco authorities.